2007 brought difficult conditions for winemakers in Bordeaux with storms in the spring and in the latter half of August. The wine gods smiled on Bordeaux, and especially the Haut-Medoc, throughout September however enabling the grapes to ripen and guaranteeing the vintage. Chateau Bernadotte again made a very drinkable classic claret style with quite soft, ripe fruit (black-currant and raspberry) together with a mellow mouth-feel and an elegant finish. The nose is particularly attractive with red fruits to the fore underpinned by a degree of earthiness. Enjoy this wine with roast beef. 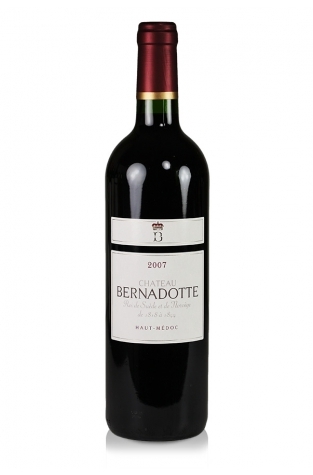 Chateau Bernadotte was acquired by Chateau Pichon Longueville Comtesse de Lalande in 1997 before both chateaux became the property of Louis Roederer the famous champagne house ten years later. Since then Bernadotte has changed hands again and is now owned by the King Power Group of Hong Kong.